Ya…they’re kinda slimy. They can be a bit smelly too. No matter how you slice ’em, kids love to explore the earthworm! These invertebrates make for some of the easiest dissections and they are great way to introduce comparative anatomy when discussing the human body. Here’s how we did our earthworm explorations – and there’s a DISSECTION-FREE option for those of you with budget constraints, lacking lab equipment, or if you object to dissection altogether! Engage: Before beginning dissections, introduce your kids to the earthworm with our paper Scienstructable 3D Dissection Model. It’s eco-friendly, budget-friendly (a single classroom license is around $10) and it’s completely authentic, down to the incisions made on the organism. This project takes about 2 days to complete, but it’s completely worth it when your students do their actual dissection and have all the skills and knowledge to dissect without destroying their specimen. 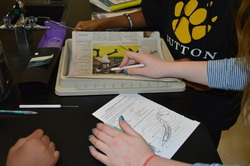 Explain It: Once you’ve wrapped up this little project, go over the dissection procedures with a PowerPoint – your presentation should address lab safety, how to cut the worm open, pictures of structures students will see, and how to clean up when all is said and done. Be sure to have students reference theirScienstructable 3D Dissection Model during your presentation to make those connections to the actual worm as well. Did They Get It? Give students a short quiz on earthworm anatomy and procedures once you’ve gone over everything. You can use their quiz scores to group them afterward. Explore It: When dissection day finally arrives, give students a lab rubric with the different structures they need to locate. Remind them to locate external structures first, then do the dissection to view the internal structures. Have them quiz each other during the lab so that everyone knows the structures locations and the functions of each one. Evaluate It: Tell them that once they are comfortable with their worms, to notify you for a group quiz. We liked to quiz the entire group to determine their knowledge of the earthworm’s anatomy and physiology, then we’d use their rubric to write our initials next to the organs they understood. Group quizzes are a great way to hold students accountable for the material, get them to work in groups, and peer tutor. Not to mention, they are so excited about the material that they are eager to participate and learn from one another! Check out the aortic arches, seminal vesicles, crop, gizzard, and intestine on this guy! Although dissections are wonderful learning tools, they can be exhausting for you! Make things easier by providing expectations up front – and if those expectations aren’t met, provide consequences for poor participation. We had a rule: three strikes and you’re out! Every quarter, students started with a clean slate. They received a strike for bad behavior, horseplay, or ignoring class rules (food and gum in our class was a HUGE “no no” in the science lab). On their third strike, students were not allowed to participate in dissections for the quarter and they would complete an alternative assignment (such as the Worm Scienstructable 3D Dissection Model or an online worm exploration) during those class periods. Keep consistent and you’ll find that students are so eager to participate that they are on their best behavior leading up to each of your activities. Being a science teacher isn’t easy! How do you handle high-stress labs and activities in your classroom? Tell us in the comments below!